AeroDri™ is a wearable tech fabric that manages moisture away from the skin and through the clothing for evaporation. Moisture management is one of the key performance criteria in today’s apparel. Moisture management is the process of transporting moisture away from the skin to the garments outer surface moisture management often refers to the transport of both moisture vapor & liquid away from the body. Wetting and then wicking is the nature of a technically designed fabric. In the heat, trapped sweat can heat up the body and lead to fatigue or diminished performance. When wearing a garment manufactured with AeroDri™ , the moisture vapor can pass through openings between filters of yarns. The polyester fibers are extruded in an angular shape and then knitted into a highly technical two stage fabric surface. The technical composition of fiber, fiber shape and knitting process all support the maintenance of body temperature. 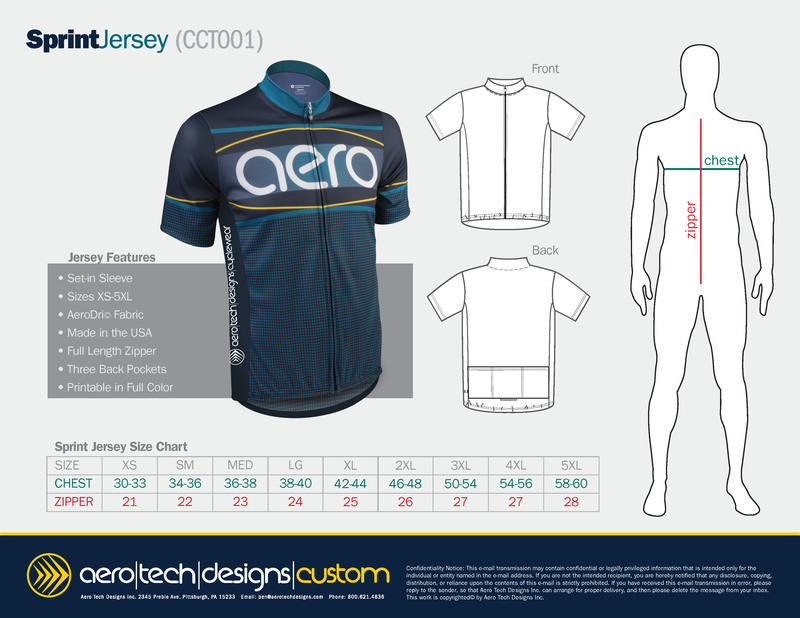 This jersey is the perfect gift for you favorite outdoors man and cyclist. It is available in sizes X-Small to 5XL in regular, sure to fit any size cyclist. Hand crafted in the USA. Three generously sized rear pockets are designed for easy access. The fit is regular and somewhat relaxed, but tight enough to keep water bottles and nutrition bars inside safely. Pockets are reinforced for long life. The hem is slightly elastic to hold the garment snug to hips to keep it in place and prevent flapping in the wind. The neckline has a sublimated, tagless label that eliminates skin abrasions and irritation from inside the garment. Frontal full length zipper with an Aero Tech Designs pull tab is standard on all Jerseys. 3M Reflective tab on the middle pocket adds value for visibility in low light conditions. 3M reflective is known worldwide as best in class and will aid in visibility.